Globally acclaimed by critics and fans alike for his unique acoustic and electric fingerstyle guitar playing,Adrian Legg masterfully blends diverse musical styles, influences and inspirations to create a distinctive sound all his own.With multiple awards and accolades spanning four decades, Legg has been heralded as a “guitarist of astonishing virtuosity, (whose) imagination and melodic invention seem unbounded,” (Q magazine); “ridiculously talented,” (Music Week) and “simply the best acoustic guitar player I’ve ever heard.”(guitar icon Joe Satriani). 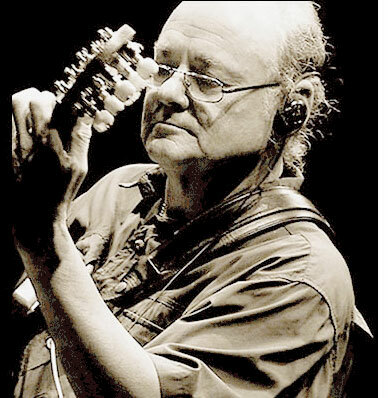 Setting the stage for his international success in the decades to follow, Legg was named as Acoustic Guitarist of the Decade by the UK’s Guitarist Magazine(1984-94), and Best Acoustic Fingerstylist in Guitar Player Magazine’s Readers’ Poll for four years in a row. (1993-96). When it comes to musical technique, Legg plays fingerstyle guitar, mixing an alternating-bass style with harmonics, banjo-peg retuning and single or double string bending. Often, he plays a piece entirely in arpeggios (similar to a classical guitar style) and extensively uses altered tunings and capos to create his signature sound. Born in 1948 in a Salvation Army hospital in the London neighborhood of Hackney, Legg experienced music as an integral part of his home life growing up; his father was a pianist/organist who led a church choir and an amateur choral society, and his mother was a singer who also played piano. Young Adrian became a choirboy and was tutored in piano and violin before finally settling in as an oboist in his school and local youth orchestras. But the music that captured his imagination was the sound of such electric guitar-led instrumental groups as The Ventures and The Shadows, beamed in from Radio Luxembourg to which he listened in rapt attention and some secrecy.With the concentration at home on classical and “proper” music, and rock or pop guitar considered less than respectable, he nonetheless cobbled together his own jerry-rigged guitars using scraps from his school woodworking class, fret wire, and junk metal bits retrieved from the local bus depot. While away at boarding school in his teen years, Legg finally obtained his first guitar (which he describes as “a dog”) from a mail order catalog and started teaching himself to play from a Shadows songbook. After leaving school, he worked various odd jobs in London and then Liverpool, where he was invited to play electric guitar in a working country band.The experience was pivotal in his development as a player, largely through hearing various instrumental techniques second and third hand and adapting them to his own approach. “I learned guitar by stealing licks from local players, getting them wrong, and having the results stolen by other players who then got them wrong again,” he explains. “Consequently, through our failures, we each developed a distinct and recognizable musical character.” The sounds of the pedal steel guitar and banjo also stoked his ambitions for what might be played on the six strings of a guitar. Following a stint in an Irish show band based in Dublin, Legg moved back to London and continued to gig in club and pub bands for his bread and butter, also touring around and outside Britain. When one bandleader asked him to play acoustic guitar chords up against a microphone, he became fascinated with the notion of blending the tonality of an acoustic with the amplified flexibility of the electric guitar.Thus began an electro- acoustic quest that continues today to find the “holy guitar grail” that melds tone, technique and technology to allow him to create, and record the music his imagination envisions, and to perform it in any environment. “I wanted something that had the harmonic content of an acoustic, and that had the flexibility in terms of stringing and volume levels, whatever you wanted to do, of an electric,” he explains. Starting to gig as a solo artist in the mid-1970s, Legg won a Guitar magazine solo acoustic competition in both the composition and performance categories, and began writing articles for that magazine and other guitar publications (and later Guitar Player in America), plus authored his first of a number of books,The All Round Gigster. He released his first of five albums in Britain in 1976. His solo skills lead to his being asked to demonstrate guitars at a British Music Fair, and shortly after he began working for Rose Morris & Company’s musical instrument and equipment head office and warehouse in Gospel Oak (their store still stands on London’s legendary Denmark Street music business strip) doing guitar repairs, quality control, product development and artist/manufacturer contact. This experience led to numerous collaborations and consultations with guitar makers, amplifier and pickup manufacturers, and technicians over the years, and a technical book “Customizing Your Electric Guitar” (Kaye and Ward, Heinnemann) which is still a reference in repair shops around the world. As another part of his instrument industry functions, his increasing development of an innovative original solo guitar repertoire helped in his conducting guitar clinics and product demonstrations at musical instrument and equipment shows in Britain, Europe and later America and Japan. By this point, his original compositions were being used by BBC radio and TV programs, and London’s Ballet Rambert also choreographed one of his songs as a dance piece. With his 1990 American recording debut of Guitars & Other Cathedrals, Legg found even greater success across the pond as a regularly touring solo act, headlining and sharing bills with fellow guitarists Richard Thompson, David Lindley, Eric Johnson, (whose 2005 album, Bloom, Legg plays on), and Joe Satriani, on both his own shows and as part of his G3 Tour package with Johnson and Steve Vai, whose Favored Nations record label released two of Legg’s albums. Guitar Player named his records, Guitar for Mortals and Mrs. Crowe’s Blue Waltz as Best Acoustic Album (1992 & ’93) and Wine,Women & Waltz as Best Overall Guitar Album (1994) in its annual readers’ polls. Through the decades, Legg has continued to delight audiences with his touring on both sides of the Atlantic. His most recently released latest double live CD, (Adrian Legg Live, October 2017) includes many of his enduring, best-loved hits with the entertaining stories behind these songs artfully woven in. Conscious of the guitar students who follow him, Legg now has three instructional videos on the U.S. market (Beyond Acoustic Guitar, Fingerpicking & Open Tunings and How To Cheat At Guitar), a book collection of his compositions in tablature and standard notation, Pickin’ and Squintin’, and now two online video teaching series at TrueFire.com, the first of which was tested during a year of teaching at a music college in the UK in 2012. As an artist who defies definition, the best way to understand the magic of the multi-talented Adrian Legg is to experience him firsthand, something that is profoundly gratifying on many levels.